Gymnasium flooring is an expensive investment. Most floors cost tens of thousands of dollars. To protect your investment, gym floors should be cleaned and resurfaced on a regular basis. However, many schools simply don’t have the budget to maintain their floors and the wood is neglected and abused for years. The effects of this begin to manifest themselves in a faded gym floor with dull lines and scratched, rough looking surface. Left long enough, a hardwood floor will begin to warp and buckle rendering it ineffective and unattractive. Here’s something else you probably already know: Because so many activities take place in gymnasiums, chances are yours isn’t used only for sporting events. Homecoming dances, proms, pep rallies, and other school functions often take place in the gym. Not to mention all the outside events that are not sponsored by the school like local church services or bake sales. These events place different, often more damaging, stresses on your floor. People wear different shoes. There are more people on the floor. Oftentimes, there is food and drink spilled on the gym floor. None of these things are particularly good for your hardwood finish and all of them contribute to decreasing the life of your flooring. 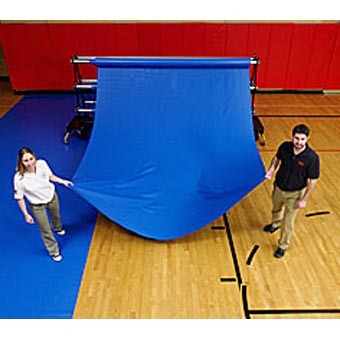 Gym floor covers from Greatmats are an excellent solution for this issue. They available in two different styles. We offer ten-foot, vinyl, sheet-rolled gym flooring that quickly and easily rolls out to protect your floor. For an average gym size, two people should easily be able to install this cover in thirty minutes. Various vinyl thicknesses are available and the thickness you choose for your particular installation should depend on the number of times you will be using your cover. (See product page for more information.) Fifteen different colors are available so you should have no trouble finding the color that reflects your school spirit. Racks can be easily closeted or tucked away making them convenient and not intrusive. Cleaning them requires only a quick mopping. Carpet tile gym floor covering is also available. These American-made1x2 meter tiles are easy to install and store as well. Unlike vinyl, the carpet will not tear or bunch even under the most strenuous situations. Carpet top gym floor tiles are non-slip and provide excellent traction. Carts are available for tile storage so you can wheel them where you need them rather than carrying them from one end of the gym to the other to install and break down your protective floor cover. To clean them, just vacuum the tiles and you’re done. It’s that simple.